Maj. Gen. Christopher Bence, the U.S. Air Force Expeditionary Center commander, pins the Silver Star on former Maj. William “Joe” Schneider during a ceremony on Joint Base McGuire-Dix-Lakehurst, N.J., Nov. 1, 2016, for his actions while commanding an 18-plane bombing raid on Feb. 23, 1945 over Italy. 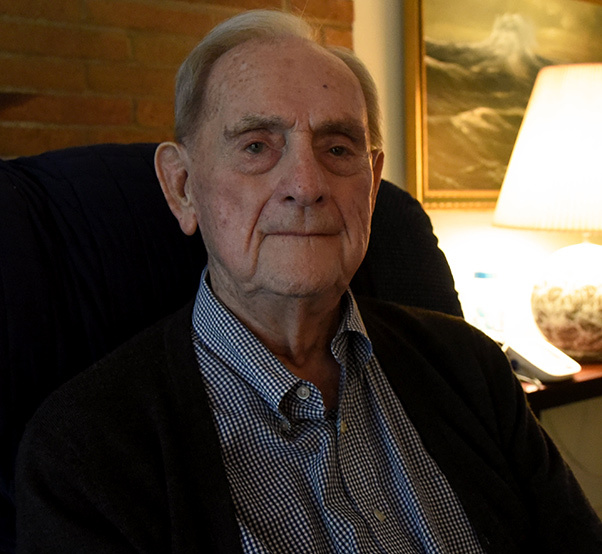 A World War II bomber pilot has finally been given recognition for his actions during a bombing raid more than 70 years ago. 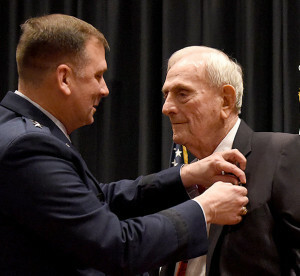 Former Maj. William “Joe” Schneider was awarded the Silver Star during a ceremony at Joint Base McGuire-Dix-Lakehurst, N.J., Nov. 1, for his actions while commanding an 18-plane bombing raid on Feb. 23, 1945, over Italy. Maj. Gen. Christopher Bence, the U.S. Air Force Expeditionary Center Commander, presided over the ceremony. “I don’t think I deserve what they’re proposing for me to get, but I think it’s good for generations to come to be able to understand what happened,” Schneider said. At that time, Schneider was assigned to the 310th Bombardment Group. His unit was known as the “Bridge Busters” because they bombed bridges in Italy to slow down the supply lines and the German’s ability to provide reinforcements to the Italian peninsula. During the mission, Schneider was responsible for not only directing the bombardment mission, but also the safety of all men in his formation. As his formation approached the heavily defended rail link at Dogna, Italy, an extremely accurate anti-aircraft barrage enveloped the B-25s, severely crippling Schneider’s plane and damaging many other bombers in his formation. 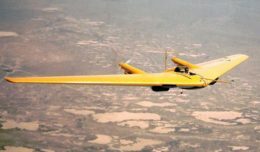 With his right engine not functioning, the propeller control mechanism inoperative, as well as the airspeed indicator destroyed and a smashed elevator trim tab, Schneider led all the bombardiers to drop their payloads on the communications point. Afterward, Schneider contacted an air-sea rescue unit to be continuously updated with accurate bearings of their location. He also communicated with a fellow B-25 aircrew in his formation and relayed to his pilot vital information to assist with the return flight. During the landing procedure, Schneider assisted the pilot with a successful emergency crash landing and the safe return of all his crewmembers. William “Joe” Schneider was awarded the Silver Star during a ceremony on Joint Base McGuire-Dix-Lakehurst, Nov. 1, 2016, for his actions while commanding an 18-plane bombing raid on Feb. 23, 1945 over Italy. Schneider was told by his commanders that his actions warranted being awarded the Silver Star, but the paperwork was lost with the Army in the rush to close down the war. However, with the support of his children and Rep. Scott Garret, 5th District of New Jersey, Schneider was finally able to get proper recognition. After returning home in February 1946, Schneider went back to Fordham University to finish his degree. While in school he met his wife, Lucille and raised eight children in the house he lives in to this day. He now has 22 grandchildren and nine great-grandchildren. “The strength of family life and the holding together of each generation, that’s the glue that keeps it all together,” said Schneider addressing the audience during the ceremony. Schneider enlisted in the Army in November 1941, one month before the attack on Pearl Harbor. Before reporting to Maxwell Field, Alabama, Schneider earned his private pilot’s license and upon arriving, he was selected to become a military aviator. In just two years, Schneider advanced from second lieutenant to major and became a squadron and group commander in charge of 72 aircraft. During his service, he earned the Air Medal with 11 oak leaf clusters and the Distinguished Flying Cross.